With a city center location near the park and the casino, the Villa Regent Marianske Lazne is among the more unique hotels in Marianske Lazne. Although it is outside of what many consider the more historic or tourist areas of the town, it is still very convenient for a guest to walk to such attractions as the Spa Colonnade, Caroline's Spring, golf course, Singing Fountain, and Ferdinand's Spring too. A visitor is also near the major railway terminal and the central business area as well. 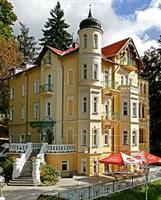 The Villa Regent Marianske Lazne is located at Anglická 116 which is approximately 19 miles from the Karlovy Vary International Airport. Each of the bedrooms in the Villa Regent Marianske Lazne is outfitted with a private balcony or terrace, satellite TV, a full-sized bathroom with tub, signature toiletries, and direct dial phone service. The Villa Regent Marianske Lazne provides visitors with services and facilities including, an in-house restaurant, pet friendly policies, an exclusive spa with extensive massage and customized beauty treatments, golf course access directly on the premises, free parking on the premises, and 24-hour front desk service.